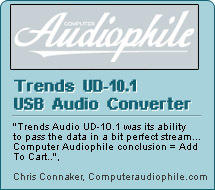 These are the four main uses for the Trends UD-10.1 USB Audio Converter. 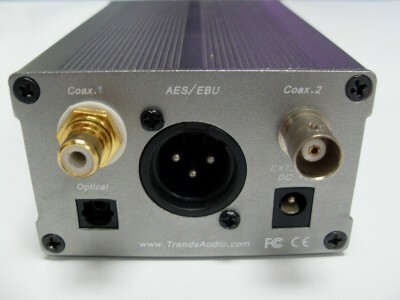 The Trends UD-10.1 USB audio converter plugs into your PC/Mac's USB port or Smartphone and Tablet with a OTG cable and lets you connect your computer, Smartphone and Tablet to your Hi-Fi or Home Cinema system easily, and with high sound quality. 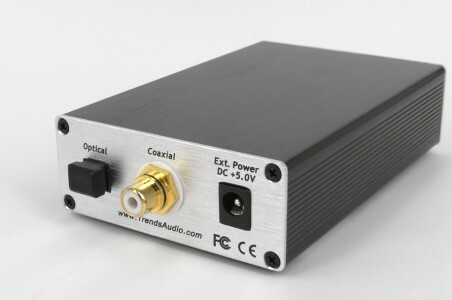 We are offering a 3.5mm analogue output to connect directly to your amplifier, Trends UD-10.1 USB audio converter also offers a choice of optical, two electrical digital (phono and BNC) and a balanced digital output to connect to an existing DAC. The Battery Charger kit is included with Trends UD-10.1 audio converter as a optional items and is highly recommended for the best sound quality giving the music a more spacious and airy presentation. Before plugging UD-10.1 to the external power, please take out the USB cable on the front of UD-10.1 and make sure that there is no power from the USB bus power. Burr Brown PCM2704 IC may be burnt if you do not take out the USB cable. - Plug UD-10.1 to PW-10’s DA/UD socket. - Fully charge your Battery (LED Indications is Green). - Plug UD-10.1 to the Battery Pack. - Turn on the Battery Pack and LED indication is Blue on the front of UD-10.1. - Connect with the USB cable and play the music from the computer, Smartphone and Tablet. Notice: Only use supplied power supply or Trends PW-10 Power Supply Unit.